World Nutella Day – February 5th, 2008! Reminder: Comment on my Introduction to Italian Candy – Caramelle post to win free candy! You have until Friday! Who can remember the first time they were allowed to eat chocolate for breakfast? Nutella is more than just a “chocolaty hazelnut spread,” it is a way of life. From childhood memories to oozing hot crepes, from breakfasts on vacation, to free-spooning sessions on the couch, Nutella is present in the memories of many of the children and grown-up children in the world. Last year we gave it its own holiday, and this year we’re continuing the tradition. Sara from Ms. Adventures in Italy and Michelle from Bleeding Espresso (and Shelley from At Home in Rome, in spirit) solemnly declare February 5th “World Nutella Day,” 2008 – a day to celebrate, to get creative with, and most importantly, to EAT Nutella. Make a recipe using Nutella. Take a picture of yourself eating Nutella with a BIG spoon. Make art with Nutella. Wax poetic about Nutella. Re-live your first experience eating Nutella. Have a Nutella-eating contest or a Nutella party! Take pictures, upload a video, and blog about it from now until February 4th, 2008. Email nutelladay [at] nutelladay [dot] com. with Subject: Nutella Day Entry and include your name, your site name, and your permalink/URL by February 4th, 2008. You can also attach one 100×100pixel photo of your dish-etc. to be included in the roundup. We’ll be posting the round-up on the 6th of February. On your blog, please include the Nutella Day 2008 badge and/or a link pointing to this post so others can participate, too! Last year’s World Nutella Day roundups – Part 1 and Part 2 for excellent recipes! Last year’s World Nutella Day introduction post with a whole list of information and recipes! We look forward to having you participate! What will you think of next? Cool! Can we also make it so that World Nutella Day requires a day off from work so we can just bake all day? Wow a year has gone by already? Can’t wait to see all the recipes. I seccond that! Another year already and so little nutella has passed these lips. I’m ready for more! I love Nutella!! Especially Nutella cookies. They are chocolate, but not so much so it bothers my hypoglycemia. World Nutella Day already? At first I thought I followed the link to an old post and realized soon after that a whole dang YEAR flew by!! I’m gettin’ old and oooh, my lower abs are aching from the recent hike. Um, yes, I still have that 3 kilo bathtub of Nutella that Shelley gave me in 06. Needs getting rid of. Perhaps I bake? Nutella is a food group of its’ own. We even have Nutella when we go camping or to the cottage. It makes wonderful S’mores sandwiched between 2 graham crackers or digestive biscuits with a melted marshmallow centre. Greetings everyone…I’m in on this…I look forward to the gooey fun! what a brilliant idea! i used to work with a bunch of girlz and we were all nutella addicts. so much so that i made nutella cupcakes for them and they were simply DIVINE! they did however, need to come with a warning on the side – FOR SERIOUS NUTELLA ADDICTS ONLY. in my experience I have found that people either love the stuff or hate it…I’m definitely a lover! 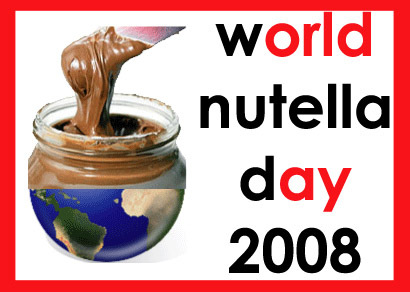 When is nutella day in 2009?